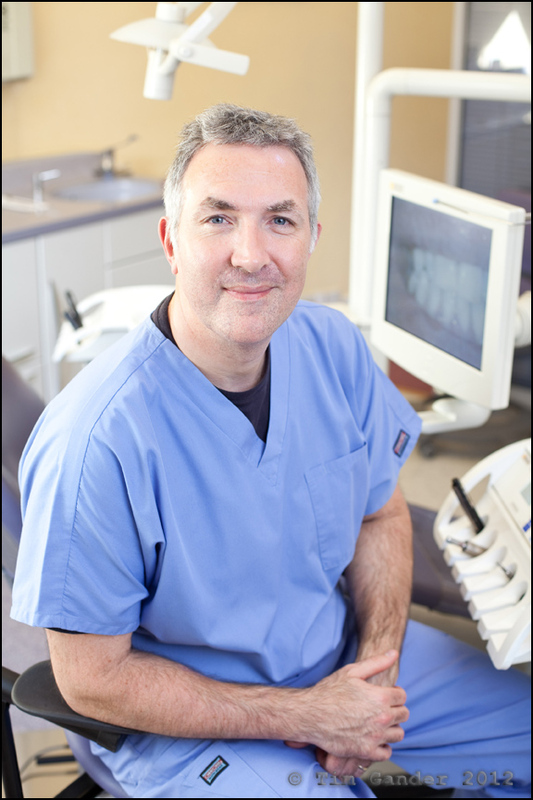 I really enjoyed working with the staff at Aquae Sulis Dental Practice in Bath to shoot pictures for their new website. It was important to capture the professionalism of the practice, but we also managed to have fun in the process. You might think having fun is peripheral to the task of getting quality images for your business, but where it’s important to show something of the personality of a team, this can best be done through humour and making the shoot enjoyable. What we ended up with was a set of images which I believe have authenticity, professionalism and friendliness written through them. But don’t take my word for it, visit the Aquae Sulis Dental Practice website and judge for yourself if the photography gives a feel for the level of professional and friendly service you’d receive if you went there. Reverse image searching has been around a little while. 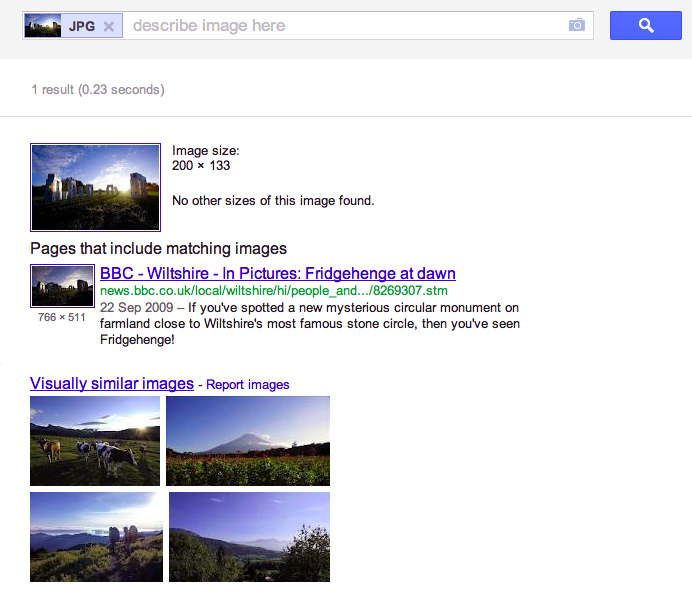 This is where you find an image and want to know who took it or you’re a photographer who wants to know who is using your work, you point a service like Tineye or Google Image Search (GIS) at the photo and they search the internet for all instances of that image appearing and return a list of results. Google Image Search will also return similar images for you to look at, which can be useful for designers looking for inspiration. Well now a new little tool has just made GIS that little bit slicker and easier to use. It’s a browser ‘bookmarklet’ you add to your bookmarks bar so it’s there when you need it. You’ll find the bookmarklet here. Follow the simple instructions and you’re away. When you’re on a web page with an image or images you want to search on, just click the bookmarklet and you’ll see question mark boxes appear over any images detected on the page. Click the image you want, and the GIS search results are brought back to you very quickly. 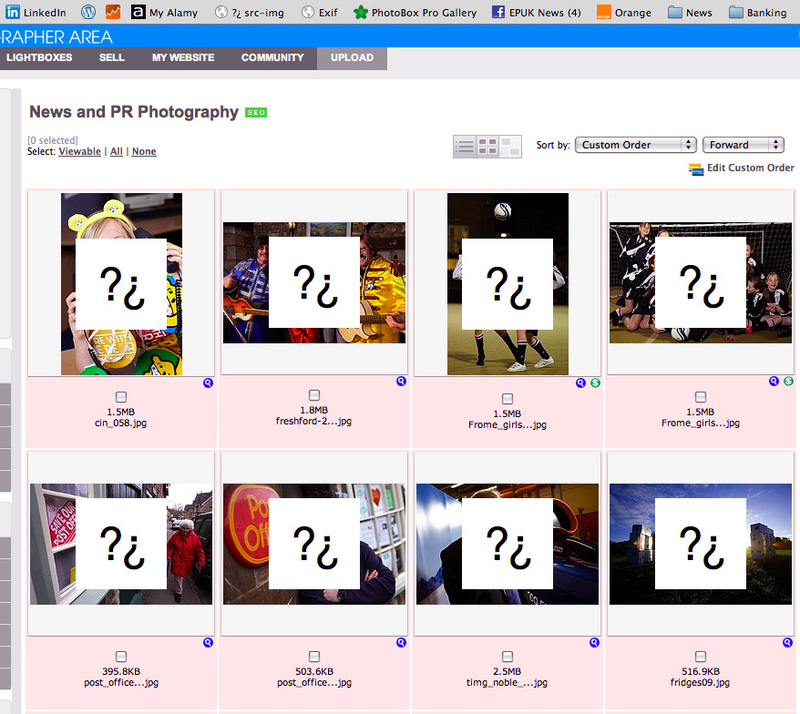 No more guesswork about how often a particular stock image is being used, and photographers can track valuable images more easily and follow-up infringements with much less detective work required than was the case in the past. The following images describe more graphically how it works. Of course it’s not perfect. 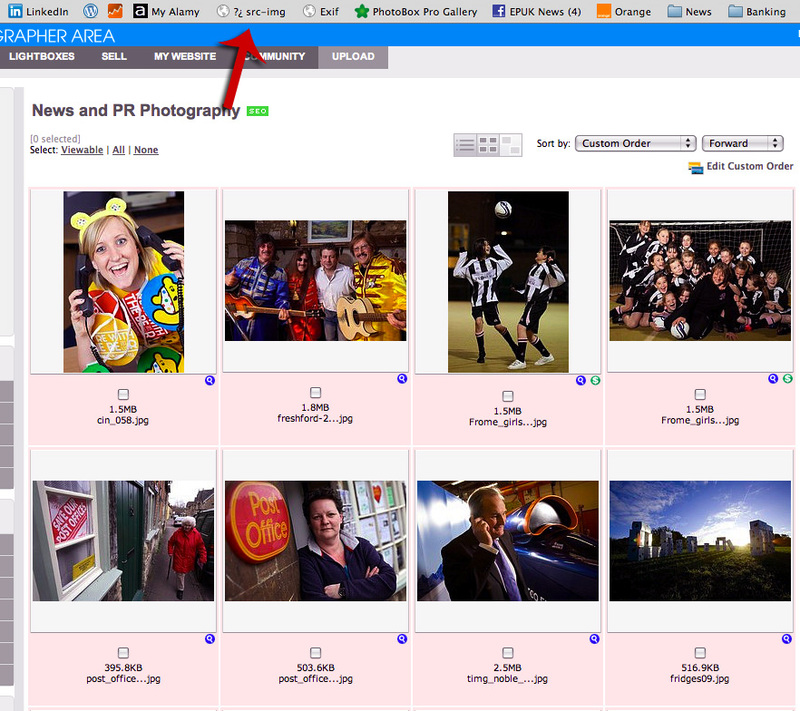 Photoshelter users will know what I mean, and to get rid of the image search boxes you have to reload the page each time, and you can only search images which are already on a web page, but have a play and you’ll get the measure of its worth for you. Click the images below to see them in detail. What will we have after Leveson? Anyone who’s been following the Leveson inquiry into press standards, and let’s face it who hasn’t been riveted by every thrilling moment, will have become aware of the bashing that has been meted out to journalists, editors and management. In many cases this opprobrium has been justified, in others it’s been pure entertainment; who didn’t enjoy watching Piers Morgan twisting in the breeze as he tried to sidestep the questioning? Or relish the vision of Paul Dacre coming to the boil when being challenged to withdraw his “mendacious smeers” comments over Hugh Grant’s accusation that Mail titles had hacked his phone. In amongst all the noise about phone hacking and the general skullduggery of journalists, some will have heard the rough ride photographers have received. Stories of press photographers banging on car windows, hiding to get the shots of grieving parents… you get the picture. The problem I have with what I’ve heard is that the newspaper industry has spent the past ten years dismantling the training and career structure for photographers. At the same time we’ve seen the rise of the citizen photo-journalist. There was a time when to be a press photographer you had to go through formal training which included lecturing in the law and the Press Complaints Commission code of conduct. And as the law and the PCC code changed, so photographers would be kept up to date via their bosses or commissioning editors. That isn’t to say all photographers were perfect, but training makes a difference. It means when a photographer oversteps the mark, there’s no excuse. There’s a course of action to be taken and discipline can be administered. A staffer might lose their job or a freelance dropped if they break the law or breach the PCC code in a flagrant way. It may be entertaining to hammer the press in the current climate, and Lord knows they’ve brought much shame upon themselves, but publishers need to start investing in training again and we have to accept that if we rely more on amateur photographers to supply our news images, the price to pay may well be more infringement. On the flip-side of that is the fact that the citizen journalist may not be aware of their rights to take pictures under certain circumstances, and in fact their rights do not match those of the card-carrying news photographer who can resist seizure of images by Police under special procedure rules set out in the Police and Criminal Evidence Act 1984. So let’s have a think about what shape we want our news industry to be in a few years from now. The internet has changed much, and will continue to do so, but let’s not get lost in the fun of the journalist-bashing we’re witnessing now or the thought that citizen journalists will democratize news-gathering. They won’t. Trained journalists and photographers provide a valuable service at the centre of our democracy. It would be easy to lose that while we’re applauding the spectacle of Leveson. I’ll take my own photos, thanks. Apart from those posts where I apologise for not posting that week, this may be one of the shortest posts I have ever written. I will simply say that every photo you see on my website was taken by me, while it would appear other photographic outfits buy in royalty free stock imagery to illustrate the kind of work they’d like to do, but can’t back up with their own examples. That is all. Have a lovely week.